Made me think how darling a Lauren Moffatt children's line would be. I love her style and think a kids line would be perfect! 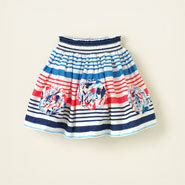 Cute skirt for Stella! Cute skirt! I bet Stella is one stylish little chick.